Meanwhile, the iconic female duos that do exist tend to be relegated to popular entertainment: best friends gabbing about trivialities or toxic friendships that perpetuate bitchy stereotypes. And although radical feminist movements have occurred throughout history, the idea of meaningful female friendships has long been excluded from public discourse. Things are changing, though. Plenty of famous women have spoken on the importance of female friendships in recent years. Women have moved into the center of the public sphere, and pop-cultural output reflects that. TV shows like Daria, Gilmore Girls, and Broad City have portrayed the power and complexity of female duos with more veracity than ever before. And soon, MTV’s Sweet/Vicious, a new show about two vigilante BFFs working together to seek justice for survivors of sexual assault, will add to that conversation — one that’s imperative to have in today’s cultural climate. 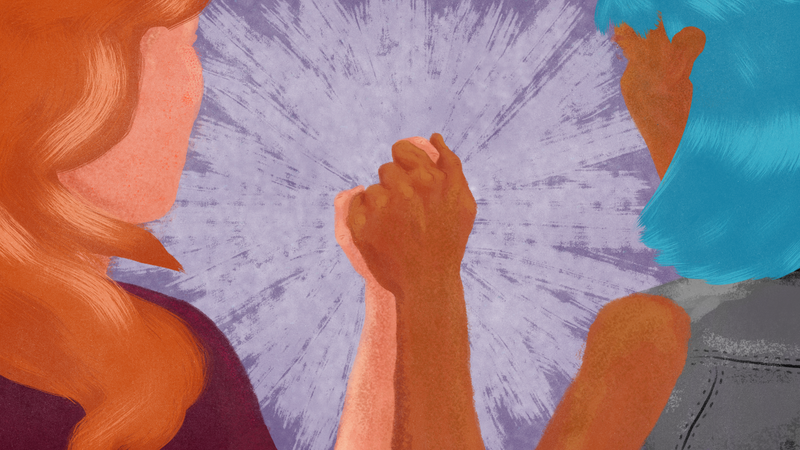 We don’t know much about the strong female friendships that came before all of this, thanks to the male power narratives that have dominated time immemorial. But let’s take a moment to appreciate the dynamic female friendships we do know about that don’t get enough play. All-girl collectives existed long before the 20th century: Women were doing it as early as 1700s Britain. The Bluestockings began as a women’s literary discussion group, with salons hosted in Elizabeth Montagu’s home. Margaret Cavendish-Harley, a lifelong friend, was a regular attendee. The two also engaged in decades of correspondence concerning everything from fashion to the institution of marriage. Along with two other Bluestockings members, they’re immortalized in a custom-made “friendship box” — a tiny gold trinket akin to a BFF locket. In an era when women had little independence, the group normalized the ideas of both female friendship and rational capability. Both women were activists in their own right prior to meeting in 1851 — and, once they joined forces, they became the century’s tour de force for women’s rights. The two established a number of political organizations, culminating in the creation of the National Woman Suffrage Association, which campaigned for a constitutional amendment for women’s right to vote. In addition to organizing for female suffrage, they published what might be the first radical feminist newsletter ever, a weekly paper appropriately dubbed The Revolution. American expats who met in Paris, Stein and Toklas were romantic partners who helped shape Europe’s avant-garde art scene of the early 20th century. While a number of notable female partners existed in this era — Sarah Orne Jewett and Annie Adams Fields, among others — Stein and Toklas were one of the few to openly write about the romantic nature of their relationship. Both were prolific writers and left a legacy through their works: Stein through an oeuvre of modernist literature, and Toklas through her autobiography and cookbook (which is revolutionary in another way: It contains a pot brownie recipe). Oprah put it best in an interview for O Magazine back in 2006: “There isn’t a definition in our culture for this kind of bond between women. So I get why people have to label it — how can you be this close without it being sexual? How else can you explain a level of intimacy where someone always loves you, always respects you, admires you?” In addition to being BFFs, Oprah and Gayle have enjoyed a productive working relationship in the context of both O Magazine and The Oprah Winfrey Show. Despite being plagued by absurd tabloid rumors throughout their decades-long alliance, they remain unafraid to steer the conversation to the idea of deep, meaningful friendship. And here we are in the 2010s. There are countless gal pals who’ve earned applause here — Tina Fey and Amy Poehler, and Broad City’s Ilana Glazer and Abbi Jacobson, for instance — and Weisberg and Zakin are no exception. The two founded TheSkimm, an email newsletter that acts like a daily news briefing, from their living room couch. The two have since amassed millions of subscribers, scored attention from Michelle Obama and Oprah, and educated voters for the 2016 presidential election. Of course, these duos represent merely a small cross-section of the female friendships that have shaped our culture today. Women are taking over the world, especially in the spheres of comedy and media, and they’re doing it with the help of one another. MTV’s Sweet/Vicious is the latest to join the ever-increasing canon of TV shows starring dynamic teams of women. The show revolves around Jules and Ophelia, college friends who are hell-bent on serving justice to perpetrators of sexual assault, as well as protecting victims. Watch the new series Tuesdays at 10/9c on MTV to see how it’s done. This post is a sponsored collaboration between MTV and Studio@Gizmodo.